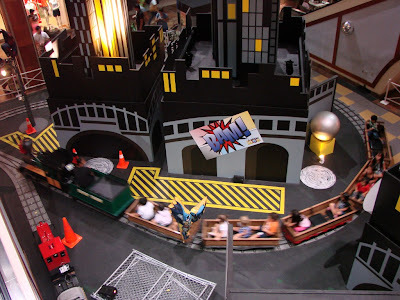 We end our Pearlridge Shopping Center’s “Hall of Heroes” series with a look at the “Super train” whizzing kids through Gotham City. 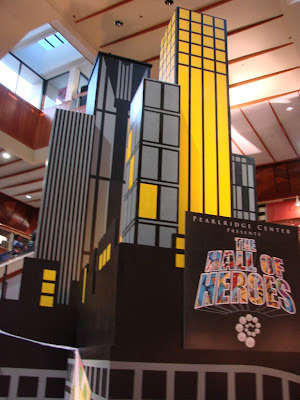 The Hall of Heroes and Super Train will run through August 5, 2012 during the normal shopping hours. The Super Train costs $3 and is available to riders under 48 inches. Please note this is a popular attraction and during peak times there can be a long wait. I hope you enjoyed our series be sure to drop by Pearlridge and check it out. There were also other Batman and comic book items that were in glass cases and didn’t photograph well. There is no admission charge (except for the train ride). 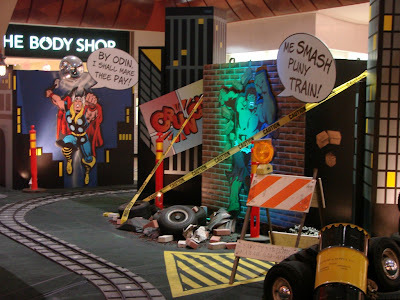 Here is a photo of the Gotham City display at Pearlridge Shopping Center’s “Hall of Heroes” display. These buildings are 30 feet tall and the city is complete with sound effects, dramatic lighting and of course comic book heroes. Speaking of which you can design your own superhero and win a trip to San Diego including airfare for two and tickets for Comic-Com 2013. See Pearlridge Hero Contest for full information. When not defending the world as part of the Avenger’s initiative Thor and the Incredible Hulk hang out at the @Pearlridge Shopping Centers “Hall of Heroes” exhibit. As usual the Hulk makes a smashing appearance hope he doesn’t run into the train full of kids that will pass by.